DEC, Digital Equipment Corporation (now owned by Hewlett Packard) has been a leader in mainframe world for several years. For connection of their systems, they developed a connector system based on modular jacks with 6 leads called DECconnect. The main difference with standard modular jacks is the key which is not in the middle, but at one side. Because of this they are called MMJ for modified modular jack. The shape of the MMJ plug makes it impossible to connect it to regular telephony or LAN networks erroneously. The DECconnect system was not only used for the mainframes, but MMJ sockets also appeared on the DEC Alpha workstations. The six available leads in the DECconnect MMJ connector are used for the main signals in serial communication: Tx and Rx for the data transmission and DSR and DTR for handshaking. In fact, the data and flow control signals are not true RS232 level signals, but RS423 level. The transmit and receive do not have a common ground, but they are differential, i.e. each line has it's relative ground level on a separate lead. By combining both floating minus leads and connecting them to the RS232 signal ground at the other side, signals can in practice be exchanged with a normal RS232 device. For this type of connection DEC sold a number of conversion adapters. For connection of two DTE devices (computers, printers, etc) the BC16E connection cable is available which automatically crosses the pins. Therefore the DEC MMJ system has a well defined way for null modem communication, something which is somewhat problematic with the original RS232 standard. Let us first take a look at the modified modular jack itself. It contains six pins which are symmetric placed to make cross over easy when a flat modular cable with 6 lines is used. In this drawing the key is oriented down and we look at the six leads. The cable used between DECconnect compatible devices is the BC16E which is sold in different lengths. On each side of this cable is an MMJ plug crimped in such a way that the cable effectively works as a cross over cable. The type number is followed by the length of the cable in feet. The BC16E-02 is the part number for the 2 feet version whereas the BCE16E-10 is 10 feet long. Don't be confused by these different part numbers, looking from the communication level they are all the same. Now that we have said this about the connection cable, how does an DECconnect MMJ based system connect? For DEC equipment this is easy. Most DEC devices are equipped with a socket which directly accepts the BC16E cable. But also in DEC's glorious time, not only DEC devices had to be connected. Therefore DEC marketed a number of adapters which make it possible to connect the MMJ jacks to a number of devices only equipped with normal RS232 compatible ports. Let's look at them in detail. For most of us at this moment the most important MMJ adapter is the adapter to connect a normal PC to a DEC MMJ cable. The original part number for this adapter is H8571-J. This adapter has a female DB9 connector on one side, and a female MMJ socket on the other. The wiring is explained in the diagram. The H8571-J adapter shown here can for example be used to connect a DEC printer with serial MMJ cable to a normal PC RS232 port. 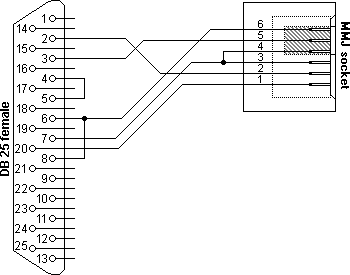 Note the connection between pin 1, 6 and 8 in the RS232 connector at the PC side. This connects the printer DTR line through the cross cable BC16E to the PC's DSR, CTS and CD inputs. Some programs need these connections to prevent paper-out and printer off line messages. Not surprisingly when we look at the era when DEC was at it's glory, there is not only a DB9 version of the RS232 DTE to MMJ converter, but also a DB25 adapter. 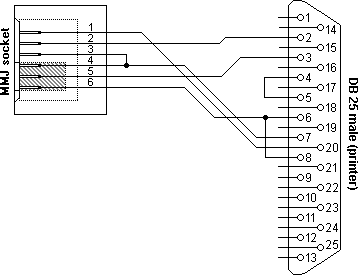 The part number of this converter is H8575-A and the pin layout is not 100% compatible with her sister. [Both ends of the adapter are female, so I consider it to have female gender red.] The H8575-A was designed for the use with a lot of different DTE type of equipment (terminals, hosts, DEC servers, etc) and not only for PC's like the H8571-J. When looking at the diagram of the H8575-A we see that the RTS and CTS are short circuited at the DTE side where the CTS is connected to the MMJ side on the H8571-J. This loopback increases the amount of MMJ compatible devices: If a RTS/CTS aware device is coupled to the MMJ cabling system, the H8575-A mirrors back the handshaking signal preventing the device from blocking the communication. DTR and DSR must be implemented properly on both sides as this handshake signal is routed through the MMJ cable and not looped back. Most serial printers are equipped with a large sub-D female RS232 connector. Therefore a male db25 to MMJ adapter is necessary to connect most serial printer to a MMJ cabling system. This type of converter bears the part number H8575-E. Wiring is identical to the H8575-A, so we won't discuss the H8575-E adapter here in detail. The wiring diagram is shown below. As you might have read about RS232, the communication standard was mainly developed for communications between DTE data terminal equipment (computers, terminals, printers, etc.) and DCE data communication equipment (modems). Each DTE can be connected to a DCE with a straight through cable. The communication between two DTE devices with a null modem is an exception of the rule. DECconnect with it's MMJ based cabling system is different in such a way that it is primarily developed for communication between two DTE's directly without use of modems. Therefore the standard connection cable BC16E is crossed. If we want to connect a DCE (modem) with this cable, we have to use an adapter which is internally crossed to neutralize the effect of the crossover cable. Opposed to standard RS232, with DECconnect connecting modems is the exception of the rule! DEC provided the H8571-D and H8575-D converters for this specific situation. The male DB25 connector of the H8571-D and H8575-D connects to the female connector on the modem. The MMJ socket accepts the BC16E crossover cable. Please look at the diagram to see how the lines are connected. Please keep in mind that the BC16E "corrects" the crossings made here and for the DTE device on the other side it looks just like a normal straight RS232 cable with handshaking lines. Look also at the strange names of the pins. The RS232 definition sees the DTE (computer, etc.) as the primary device. 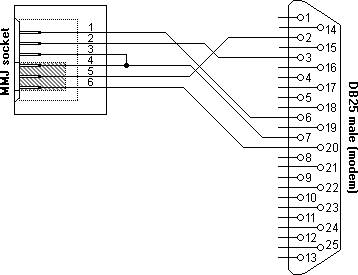 Therefore pin 3 is called Rx receive also at the modem side, although it is an output for the modem. So the pin names are right here. It is the result of the crippled definition of the most widely used serial communication standard. You have to live with it, it won't change after the forty years this definition already exists. Two other interesting products from DEC to connect MMJ to DB25 are the H8571-C and H8571-F cable adapters. The H8571-C has been sold as a separate product and is equipped with EOS/ESD protection. The H8571-F is a low-cost version of the same adapter which was only shipped with DEC terminals and printers. The H8571-F lacks the EOS/ESD protection. These adapters are not for connection of devices directly, but instead connect to RS232 cables. The assumption is that all necessary crosswiring, loopbacks etc are already present in the RS232 cable so—in combination with the BC16E crossover cable—these adapters provide just a straight connection between both sides. Because of this the internal wiring of both adapters happens to be identical to the wiring of the H8571-D and H8575-D adapters. The only difference is mechanical where the H8571-D and H8575-D have screws and the H8571-C and H8571-F have stand offs. There is one child left in the whole DECconnect family. It is the H8572-00 adapter which accepts a BC16E cable at each side. The main purpose is to interconnect cables. The internal wiring of the H8572-00 is identical to the BC16E i.e. it neutralizes the cross links inside the cable. varies inversely with the fundamental solvency of the firm.